East Area Volunteer Emergency Services Inc. Since 1976 EAVES has been housed in the former Town of DeWitt Water Department building on New Venture Gear Drive. The current location is not adaptable to meet the needs of the community or the organizations mission. In order to provide a better service to benefit the entire community, it is necessary that we re-locate to a more central part of our primary response area. The need for timely emergency medical response is a necessity, not a luxury. 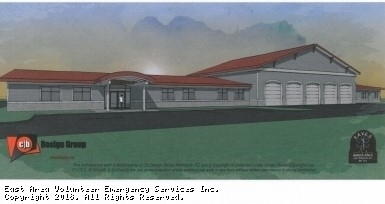 This proposed new facility is a very basic no frills concept to house all of our emergency vehicles in a single location, provide space for training and education of both emergency responders and public education in areas of CPR and first aid, will serve as an emergency shelter in times of disaster, a treatment room for walk in patients, additional bedrooms so more staff may be added, and administrative offices. The general public is under the impression that ambulance service is covered in property taxes, this is not true. EAVES in fact does have contracts with the Town of DeWitt and Village of East Syracuse that amount to 25% of our revenue. The contract monies do not make up for the over $500,000 annually in lost revenue due to poor insurance reimbursement rates. Over 60% of the calls EAVES responds to involve those persons on either Medicare or Medicaid and these government programs reimburse us LESS than the cost of performing service. When EAVES was founded in 1973, the original members were 100% volunteer and this organization remained that way all the way until 1995 providing 100% free ambulance service to this community. As laws, regulations, and policies changed it became necessary to begin billing for service and hiring staff. The demand for service is much greater current day than it was 40 years ago. EAVES now responds to more than 3,000 calls annually and we need to grow the organization to meet the demand for service. We currently staff 3 ambulances at a time and hold several training classes, the original building was never designed for this use. EAVES remains a not for profit volunteer based ambulance service, there are no high paid executives or stock holders. The entire Board of Director's are all volunteers as well as several volunteer emergency medical technicians.We remain committed to serving this community and need your help to do so. This organization is audited every year by a third party CPA firm and those records are shared with the local governments. Our IRS 990 filings are available for your review in the "files" link on the left side of this webpage. This is a community facility, it benefits you, the public. YOU CAN HELP, BUY A BRICK TODAY. Forms for donations are in the file library to the left side of this page. Engraved bricks are available for purchase that will be placed in or around the new facility. We are able to accept check or credit card payments/donations. Should ambulance service be paid for through property taxes like fire and police service? This site has been viewed 154,160 times.